Quirky Custom Corporate Gifts, Worthy of oohs and aahs! Your company thrives on thinking outside the box. Why settle for mugs and pens to represent you? Corporate gifts have never been so lovable . . . until customizable LEGO® minifigures and sets came along. You remember how much you loved LEGO® sets as a kid, don’t you? It turns out, so does everyone else. They grew up to be your target market. And now you’ve discovered a playful way to leave a lasting impression. 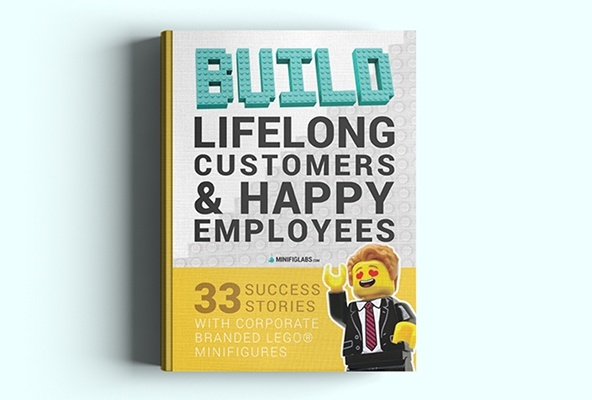 Minifiglabs helps companies capture their unique personality by producing customized LEGO® minifigures and sets. 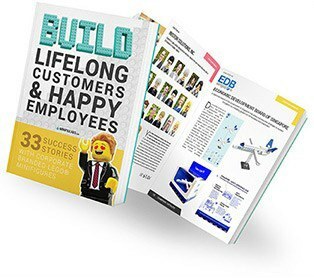 Whether the goal is to cultivate a happy workplace, promote the brand, or create marketing buzz around a product launch, LEGO® minifigs and sets can do the trick. Steal some ideas from dozens of the most innovative companies who’ve already partnered with Minifiglabs, including Google, Cisco and Sony. As you’ll see in the FREE idea ebook, no project is too complicated for the experts at Minifiglabs. What makes Minifiglabs different from other suppliers? A diverse group of designers, animators and production engineers, we’re masters of the LEGO® art style and customization. Every member of our team is fully immersed in the entire process from designing to printing. We’ll go the extra mile to understand your unique needs. We’ll make sure your creations blend in seamlessly with existing LEGO® minifigures and sets. Trusted by . . .
Do you require minimum orders? Our minimum order quantity is 50 units. The more units you order, the more economical your order will be. Are these authentic LEGO® parts? Yes, our products are made of new LEGO® elements that have been repackaged or altered from their original form. We are in touch with The LEGO® Group’s legal consultants and we follow The LEGO® Group’s legal policies. How soon after submitting my enquiry will you respond? We guarantee a response within one business day. If you inquire on a weekday, you’ll likely hear back from us within 24 hours. What’s your pricing for custom LEGO® minifigures and sets? Our prices vary based on many factors including quantity, colour, packaging, shipping and more. Use the free ebook to get ideas on possibilities for your company, then contact us for specific pricing for your needs. DISCLAIMER: LEGO®, the brick configuration, and the minifigure are trademarks of the LEGO Group, which does not sponsor, authorize or endorse this Web site/Service/Product. This is not a LEGO® service. The products comprise of new LEGO® elements that have been repackaged or altered from their original form. LEGO is a trademark of The LEGO Group, which does not sponsor or endorse this service. The LEGO Group is not liable for any loss, injury or damage arising from the use or misuse of this service.